Tesco chief executive Sir Terry Leahy has been branded the "godfather of British binge drinking" by a Labour MP. John Grogan chairs the all-party Parliamentary beer group, which receives funding from breweries. He used a Commons debate to push for action against supermarkets selling alcohol below cost price. A Tesco spokesman said his remarks were "as offensive as they are inaccurate" adding the company had a "leading role" in tackling binge drinking. Mr Grogan's comments came as MPs debated the health consequences of the availability of cheap alcohol. The Selby MP, a longstanding advocate of the pub trade, said: "It is with regret I say this, but I do really want to charge Terence Leahy, the boss of Tesco, as being the godfather of British binge drinking." He said Competition Commission research showed Tesco, Britain's largest supermarket group, had underpriced beer and lager during last year's World Cup by £15.1m. And he claimed the supermarket giants carried on the practice of selling alcohol below cost price "all the time". "We are talking about selling alcohol below the cost of water. It isn't baked beans. There has to be a little bit of a different attitude," said Mr Grogan. Sir Terry and other supermarket chiefs met Prime Minister Gordon Brown last week for an "alcohol summit" in Downing Street. But Mr Grogan said they had not come up with any serious proposals to address the health problems caused by binge drinking. He backed calls by Barnsley MP Eric Illsley, made earlier in the debate, for supermarkets to follow the pub trade by establishing a code of practice to "outlaw irresponsible promotions". Mr Grogan told MPs: "Sir Terence Leahy must address this issue. They must stop putting their heads in the sand, the big supermarket bosses. We want some leadership from these very powerful individuals." A Tesco spokesman said Mr Grogan's comments did "nothing to inform the serious social debate on binge drinking". "Alcohol abuse is of course a serious concern to us all and we are playing a leading role in the efforts to tackle it. "The vast majority of alcohol bought at Tesco forms part of the weekly family shop. "We also know people tend to stock up on beers and wines for home use during promotional periods and consequently buy less at other times." Opening the debate earlier in the Commons, Health Minister Ben Bradshaw said shops selling cheap alcohol could face new laws. He told MPs: "We remain concerned about the practice by shops and supermarkets of deep discounting promotions - often as loss leaders and below cost price of alcoholic products." Ministers have ordered an independent review, due to report next summer, into the relationship between pricing and promotion of alcohol and the harm to health. "Depending on the review's findings, we are prepared to change the law," said Mr Bradshaw. "It's in all of our interests to reduce the harm to health and the costs to society of excessive alcohol consumption, while avoiding unnecessary or nannyish restrictions to adults who wish to enjoy a legal product." 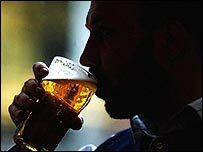 Mr Bradshaw said the government was particularly concerned about drinking by young people under 18; 18 to 24-year-old "binge" drinkers and older "harmful" drinkers. Downing Street said the issue of pricing was raised at Mr Brown's recent alcohol summit, but the prime minister's official spokesman said: "These are decisions made by commercial organisations."